Today Tibet is known as the most problematic geographical area in the whole Asian continent. The Tibetan plateau which has an area of over 2.5 million kilometers is today under the hegemonic rule of the Chinese government. This has become a spark plug for many controversies which have even rocked international politics. Major nations of the World in the right - left wings and the central organizations like the UN have closed their eyes deliberately on the human rights violation of this land. The NGOs who do independent work are often doubted as receiving foreign aid and this has in fact affected in their true mission. Those political organizations who speak loudly for Iraq and Afghan have deliberately forgotten the troubles of Tibet. Here the ordinary people should wake up. Independent thought should arise. But even the independent thought of people is being banned by the government claiming on the policies of diplomacy and securities. People’s response to such bans is a topic of study. It is interesting to note that such a discourse has come up at the time of the 2008 Beijing Olympics. The Olympic torch relay was blocked by the ‘Tibetan separatists’ (official notion) at many places. It is to be assumed that the protests will continue and in doubled strength. In this juncture it should be thought that the title of this essay too is confusing. As known or heard in the common sphere it should have been ‘Tibetan Politics and the Olympics’ and most of the times it’s like that too. The transfer of the torch relay from Mumbai to Delhi; the reduction of the relay path from nine kilometers to three kilometers; the eight feet high safety fencing of the Rajpath and associated security setups; the hacking of the servers of the External Affairs Ministry are all matters along with this. The Tibetan issue which is being known from 1949-59 was debated in many occasions and we got many new realizations on the topic. But this problem once again surfaced during the 2008 Beijing Olympics. The media celebrated it. The discussions helped to understand Tibet in today’s light of events. It was at this juncture that the Captain of the Indian football team Baichung Bhutia announced that he is backing off from the Olympic torch relay. This was a great instance in the Indian athletic history. This has caused the non-sports personnel like Kiran Bedi to back off and Aamir Khan to publicly announce his support for Tibet. But almost the whole of the Athletic world was against it. The majority of the sports personnel suggested that sports and politics cannot be mixed. But it should be understood that sports has a universal political dimension above mere cheap sectarian politics. The athletic world assures a higher brotherhood. This ‘higher brotherhood’ is also the aim of Olympics. Has the modern Olympics successful in achieving these goals? One has to check this question as the modern Olympics has passed a hundred years of existence. The Olympic movement has strong political undercurrents then and now. The decision on who, where, when and what way to play is done in political circles. The chairman of the Indian Olympic Association Suresh Kalmadi was the minister for sports in the former NDA ministry. The chairman of the Indian Cricket Board Sharad Pawar is the minister for agriculture in the current UPA ministry. The more sports politicians than sports personnel. This is because the present sports field is a million, billion and even a trillion dollar business. A seven star market! Even otherwise why sportstars are known in the name of their country? Even if this is a classification for easy conduct of the games; then why on the prize distribution ceremony the national flag and national anthem of the winner are used? Why the individual achievements like gold, silver and bronze medals are counted under the credit of the country? This political classification helps most of the athletes to get acceptance and honors from ones own land. It can also be thought that this desire for acceptance and political pressure are the cause for many a doping incidents. Thus the notion that sports is above all politics becomes a joke! If brotherhood and friendship was the aim there will be no place for competitions and records?! Perhaps the intentions of the French Baron Pier de Coubertin in starting the modern Olympics based on the ancient Olympics would have been political too! It’s not much different in the individual side too. The cause for the well known Ranji player from Kerala Ananada Padmanabhan didn’t get place in the Indian team and the reason for why many other athletics teams don’t get even the basic requirements when seen against the Indian cricket team is not much different. They are all the real life examples of political intervention on sports. Much of the talented athletes have been thrown out in the selection stage itself. When Rajyavardhan Singh Rathode; India’s one and only Olympic silver medal; received Pathma Sree and Arjuna Award in the same year; many senior athletes were just not even mentioned. These sports stars are not nonentities in the field of sports; they have achieved their goals by hard work. The only difference here is in saying that sports have no relation with politics. The common man has to suffer many changes as sports and games are held and related construction works are being undertaken. A very good example is the preparation for the 2011 Delhi Commonwealth Games. Though the 1982 Delhi Asian Games village had turned into a vast residential complex; there is a new games village and stages are being built on the banks of the great river Jamuna. If another games comes in the only option will be to build lodging and staging facility. Nobody looks into future and builds a permanent fixture. There is no fixed stage to host all types of games and there is no fixed village to include even the greatest of the athletes. The nation’s resources are being carefully wasted on here! More people mean more facilities. But since the facilities are few; it’s being robbed from the ‘have-nots’ and is being reallocated to the ‘haves’. This paradox happens in the same country where there are people living far under the poverty line. More people, more facilities, more vehicles - what ever is above the proper mark in the modern society makes an even greater problem in the society - pollution! Thus the associated activities of the sports field cause health hazards to ordinary people. The shop sealing controversy in which the former Chief Justice of the Supreme Court YK Sabarwal was involved too was much the same. Prior to the 2011 games the ordinary auto, taxi and bus drivers in Delhi are going to lose their jobs. They have to seek for better vehicles according to the government norms. Nothing more should be said about the migrant workers who come in search of work. Here also with each associated work in the sports field those who are thrown out are the poor and wandering; in order to create better facilities for the middle class society. The story of the Indian Premier League too is not different. We have seen the IPL and the related auction of the players involving millions of rupees. The media presents a number of advertisements which are far more against the so called ‘thousands of years of Indian tradition’. They speak of a situation where one is deliberately attacking another for not supporting his team. There to Baron Coubertin says; “What matters is not victory or defeat: what is more important is participation.” Then why should the participation be like a preparation for war? One can see international politics in the International Olympic Committee (IOC) which organizes the Olympics. The IOC chairman is selected based on the decisions of nations - especially the mighty ones. The decisions of the IOC too are for the mighty ones. The leader in the boycotting of the 1980 Moscow Olympics was the then American backed IOC president. It was not just as coincidence that the next Olympics got staged in Los Angeles. None other than a European white male has become the chairman of the IOC. It hasn’t come out of the male chauvinistic attitude. There is no participation for women in policy making ventures. So there exists a big political play going on in there. Every Olympics is being selected by the mighty powers. The venue is being auctioned and the one which gets more support from the mighty nations will get the Olympics. This has started bribery for the support of nations and it was a great scandal in the 2004 Olympics. The reason for not holding Olympics in an African or an Arab nation or any where in Latin America except Mexico or only in the metro cities of Asia like Moscow, Seoul, Tokyo and now in Beijing in Asia and the selection of the European and the North American cities is none other than the above mentioned. This is also because of the Euro centered race-color-nationality politics of the IOC. The so-called motto of the Olympics ‘faster, higher, stronger’ is now a days only a market strategy. More than any sports event Olympics has become a celebrity item. The game is now controlled by the global market giants! The Olympics today is another face of the global market. Sports and games are marketed based on the wishes of the market. This is the reason why global giants sponsor events or individuals. Under pleasant names of brand ambassador and official sponsor they have made sports into a market and the aid to make money. In all the relationships between the athletes, athletes and the government, athletes and the people all money and its transactions has become an important factor. The betting controversy in an earlier India South Africa cricket series; involving former South African skipper, the late Hansie Cronje with team mate Herschel Gibbs and the former Indian skipper Mohammed Azharuddin and team mate Ajay Jadeja is a good example for this. The Olympics also tells none different from these. All the objects sold in the name of the Olympics will be a memorabilia and will be treasured by the owner. It won’t be used for ordinary consumption. Thus even ordinary things can be sold of at high prices. Thus in almost all the locations associated with sports - especially the Olympics, the Asiad, the Commonwealth Games, the World Cup and all - becomes a stage for the global market. Here money flows freely without any constrain. This is a situation that has started from the 1976 Montréal Olympics from whence the expenditure for the Olympic Games has steadily increased. In short it is none other than a glorified bazaar. The justice rendered here is of the mighty ones. The modern world faces a situation where everything is being purposefully worked for the market. The response of the western nations towards this market based setup after the 9/11 disaster is to be studied in detail. They will bring in all sorts of tricks to get hold of this trillion dollar market space. Ideologies are simply objects for sale in this market place. Thus human rights too become a subject for the market strategies. They simply forget the human rights violations they conduct in and around their country and start to speak about the violations in other countries. Even when blocking the import of goods from such alleged countries is being prevented by the state they never seize to stop their own exports to that country. This is the politics of the mighty. Hence with such techniques they get an unopposed market. If ordinary advertisements are two dimensional there is third dimension of ‘close understanding of the products’ in the athletic and non-athletic festivities. The profit is shared by the producer, supplier and mediator (applicable only for global trade monopolies) in this game. All these things are unknown only to the IOC which keeps on saying that its aim is ‘world peace’. Not even the great Baron Coubertin criticized the First World War! The same was with the Second World War and the games were banned for two consecutive terms in 1940 and 1944. This was not a political subject for the sports personnel because they were fighting in different political sides. The 1980 Moscow Olympics was boycotted by the Western countries alleging that the Soviet Union had invaded Iraq. Immediately on the next issue in 1984 Los Angeles Olympics the whole Eastern block refused take part in the games owing to the chauvinistic approach of the United States. They even organized an alternate Olympics called Friendship Games too. Thus the argument that only the games which are held in Socialist (?) - Communist countries are boycotted is invalid. Here the game played by President Jimmy Carter and President Yuri Andropov are none other than politics. It’s even noted that Carter was the most popular president of the modern United States. This time other than that national politics since commercial politics comes in ‘the (mighty) World Leaders’ will only boycott the inaugural ceremony only and they will be in all other occasions. This conclusion is to be seen in the light of the current visits of the French president Nicholas Sarkozy to China after the disrupted Olympic torch relay. Another thing to be remembered is that none of these nations wishes to have an adversary rising up as global power. To prevent this they will even dress up as Tibetans and extinguish the torch. The real innocent ones are viewed under suspicion and they are blamed for all the problems while the real culprits’ sit happily in the pavilion. There are those who have succeeded fighting against all these odds like the legendary Jesse Owens (1936 Berlin Olympics) and the great Bob Bemoan (1968 Mexico Olympics). It is recorded in history that Owens came up with strong protest against Carter on the boycotting of the 1980 Moscow Olympics. Like wise ‘the whole concept of friendship above politics’ is a result of many political power plays. ‘Can the Olympic Games be boycotted?’ is the next political riddle to be answered. Here also the sports personnel comment is the same; that it cannot be done. The boycott of the political personnel is set only on the achievement of political goals. But Olympics was boycotted by athletes themselves too. The first of such boycotts happened a hundred years back. The 1908 London Olympics was boycotted by the freedom loving Irish athletes. The Jewish population as a whole boycotted the 1936 Berlin Olympics which was part of the Nazi state’s propagandist policy. The 1964 Tokyo Olympics banned South Africa from participating and at the same time it was boycotted by Indonesia and North Korea. The 1968 Mexican Olympic Games was opened with the brutal massacre of two hundred odd Mexican students by the Mexican militia. The 1972 Munich Olympic was the cruelest of all. Eleven Israeli athletes were shot dead by the Palestine supporting ‘Black September’ terrorist outfit. The same story is reiterated in Spielberg’s famous film Munich (2007). The 1976 Montréal Olympics was boycotted by about twenty six African countries on a disputed rugby match between South Africa and New Zealand earlier in the same year. In the end of it all here in 2008 Beijing Olympics the Tibetan activists are protesting. Now it’s the Olympic Torch relay that is targeted by the protesters. The 1928 Antwerp Olympics was the venue where it was decided to have an Olympic Lamp. 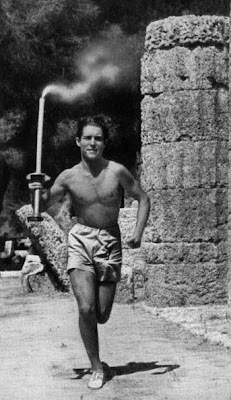 The Olympic torch relay became part of the Olympic Games only with the 1936 Berlin Olympics. It was planned by Goebels, who was Hitler’s propaganda minister; to show off the development of Germany under the Nazi rule. From then on to 2000 Sidney Olympics the torch was lighted at the temple of the Greek goddess Hera and was brought to the Olympics venue. These are all market strategies claiming their origin to the ancient Olympic Games; just like the lavish opening and closing ceremonies. In any way isn’t there a stench of Politics creeping from the ritualistic performance of the Greek actresses dressed as priestesses of Hera in lighting the lamp from solar mirrors; the switching on and off of the ‘great’ Olympic torch by the authorities (2008 Paris protests) and in the consideration of the games as politics free! The Olympic torch and its global journey started with the 2004 Olympics aiming at the global market. In the meantime the IOC has come up with a new logo called ‘One Dream, One World’. One dream and one world for globalization! Every games village is the miniature representation of the global village (of the selected few) and it’s also the representation of a ‘use and throw’ living system. Here too the sports world sung the same old song as this journey cannot be missed due to its centuries of tradition. The IOC too backed this argument. There was also politics in it as many of the athletic/non athletic participants were selected by the earlier mentioned global market monopolies. The torch bearers were just contract laborers and once you break the contact it’s the end of your tenure. Finally we live in a highly political world. Nation, race, language, customs are all the criterions through which we are politically stratified. In such a situation it is totally ridiculous to claim that a single subject has no relationship with politics. Thus our sports world ought to think in a more open manner. Accept what should be accepted; deny what is to be denied; participate or not tell your opinion to the whole outside world. It is not at all good to keep on muttering that politics and sports have relation with each other. Can’t you just put up a very small protest or opinion for the millions of ordinary sports lovers and the non-sports lovers with a strong back bone? Perhaps it is because of this same inability that will draw the athletes to oblivion in the days of their old age! When I am righting this too there is the controversy hot in the air. The new sports minister MS Gill has said that the Olympic torch is to be carried by sports personnel only. Many like Milkha Singh has agreed to this and the IOC disagree with it. In the meantime the rehearsal is disrupted by the protesters. The ‘people’s torch’ is held away from the people of Delhi. States like West Bengal bans the protesters and states like Kerala taking part with Olympic Torch solidarity pledges while some others protest against it. Don’t you smell the dirty stink of politics?